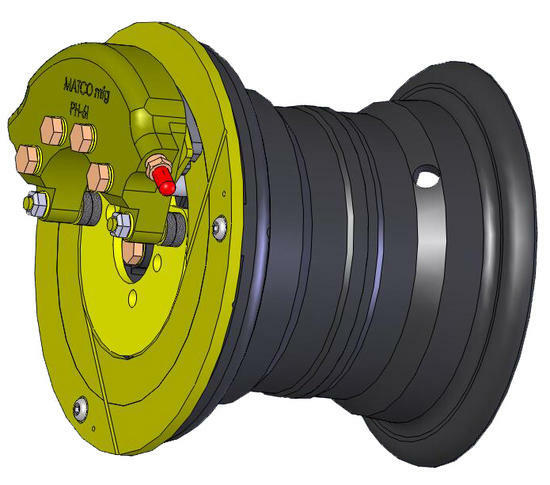 MATCO mfg produces this outstanding 600X6 wheel with a triple piston I Series brake assembly. The WI600XLT-1 configuration is specifically for the PA-18 AXLE installation. This wheel and brake assembly is designed for use on high performance aircraft over 2,000 pounds that require maximum braking dynamics. The machining on this wheel produces a clean smooth surface to accommodate a variety of commercial tires to including Goodyear, McCreary, Michelin, and others. The WI600XT and WI600XLT series wheel can be used in conjunction with the A6 bolt on axle for ease of installation. The A6 axle is manufactured using 2024-T351-T4 alloys and has a bolt hole circle of 2.25 to match the Cessna bolt hole pattern. The -1 & -2 configurations have shorter bearing spacing for installation on PA-18 style axles. The -2 configuration has the required bolt pattern for the RV-10 installation and caliper orientation. A key feature of the WI600 Series wheels and brakes is the use of the thicker M66-105 lining to provide more wear life and greater availability. MATCO mfg uses the latest generation friction material for the longest life and best performance. As with all MATCO mfg brakes, the SwiftLine pad replacement program is available for faster relining and reduced cost.